Dr. Dehgan heads the Office of Science and Technology within the new Bureau of Policy, Planning, and Learning. 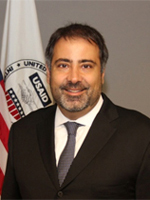 As the S&T Adviser, Dr. Dehgan serves as the key focal point for implementing the Administrator's vision to restore science and technology to its rightful place within USAID and ensure that USAID is the global leader on employing science, technology, and creativity to help solve traditional and persistent development challenges in novel ways. Dr. Dehgan holds a Ph.D. and M.Sc. from The University of Chicago’s Committee on Evolutionary Biology, a J.D. from the University of California, Hastings College of the Law, and B.S. in Zoology and Political Science from Duke University.